Per Ian Rapoport, New England Patriots cornerback Cyrus Jones is out for the season with a torn ACL, and a partially torn meniscus. Jones was entering his second season with the Patriots after being drafted 60th overall in the second round last year. The Alabama product has been somewhat of a disappointment, only logging 147 snaps at cornerback last year. He ended the season with an overall grade of 64.3. Jones did however show capabilities as a returner, returning 11 punts last year with a long of 13 yards. He also returned eight kick offs, with a long of 43 yards. Continuing his defensive struggles this preseason, Jones allowed the second-most yards after contact (amount of yards a cornerback allows whilst in primary coverage) among 206 qualifying cornerbacks, with 96. 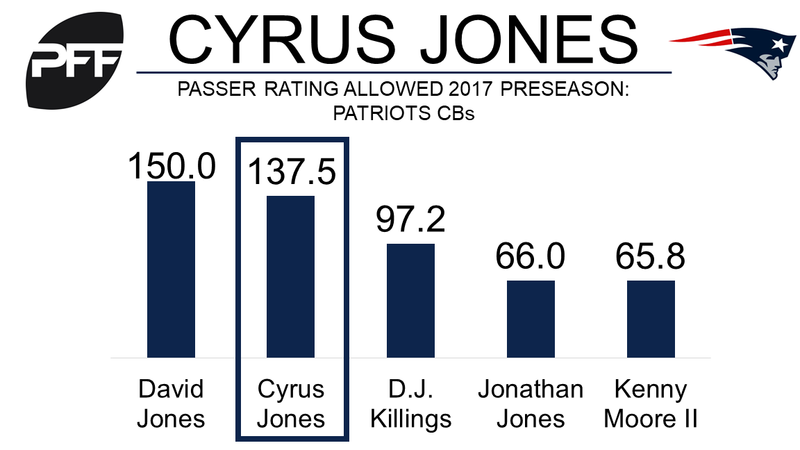 He allowed a passer rating of 137.5 when targeted, the 18th highest this preseason, and second highest among New England cornerbacks.